For the highest quality, we have our premium fabrics. Here you will only find the best of the best. Some fabrics and materials are so unique we only sell them for a specified amount of time. Our Easy Care shirts require less ironing than a regular shirt. These shirts require almost no extra care; they come out close to wrinkle-free directly from the washing machine. Independent certificate that guarantees, first, that the components of a product are not harmful to health, and secondly, that the processes of elaboration of the same are respectful with the environment. Vitale Barberis Canonico is a fabric mill in northern Italy since 1663, with an outstanding reputation in the tailor/garment industry. The mill produces fabrics that are renowned for their outstanding quality and designs. You will only see the well-recognized Woolmark logo in the textile industry on fabric which is made from 100% pure new wool. 2 ply fabrics have higher durability than single-ply fabrics. A 2ply fabric means that 2 yarns are twisted into 1 single thread. This gives you double the comfort, double the durability, and double the quality. Some of the Tencel Fabric advantages include; it's extreme comfort, it's resistant to wrinkles, and it's so breatheable it even absorbs moisture better than cotton, it's lightweight and therefore very comfortable to wear, and the fabric is very durable (it will last a long time, both in wet and dry condition). Do you want to feel the fabrics? A Tailored Pants that will fit you perfectly is a dream for everybody. 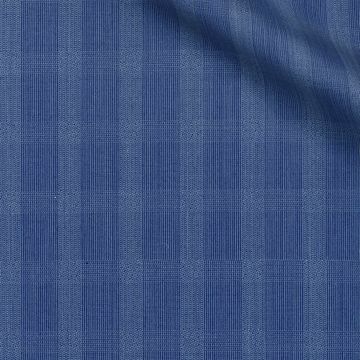 We want to help you achieving that dream by creating your own Blue slim fit checked Wool Blend Pants. We provide you with the design and you choose if you like it or if you want to change the details with our online configurator. This Tailored Blue Pants is made of Wool Blend , the perfect fabric for the winter. It's strong and durable and will keep you warm during the cold winter days. Your Blue slim fit checked Wool Blend Pants would be completely made to your likings and measurements to make sure it fits you perfectly. Thanks to our high quality control and experience we can offer you a perfect fit guarantee. If you want to know more about our Perfect Fit Guarantee read here. Perfect for formal pants, Helps showing smart and clean image. Take your measurements wherever you are. You don't need a tailor, you just need a friend. Hockerty is the fastest made-to-measure company in the world. Our customers all around the world enjoy FREE SHIPPING on orders over $150. we pick up the cost. No problem. We’ll remake it for you. "I am sure many players would be interested"
"Great service and ideal perfect fit"
Founded in 2008, Hockerty is the e-commerce leader in custom suits and custom dress shirts, as we offer our customers complete freedom to design their own clothes by choosing from a wide range of styles and fabrics.